Spring is the time for rejuvenation. It’s that time of year when we dust off the snow, crawl out of hibernation to greet the warm breezes, longer days, and budding flowers. Since that stupid ground hog saw his shadow or something, that means Mother Nature might not be ready for spring, but we sure are--predictive rodents be damned!!! 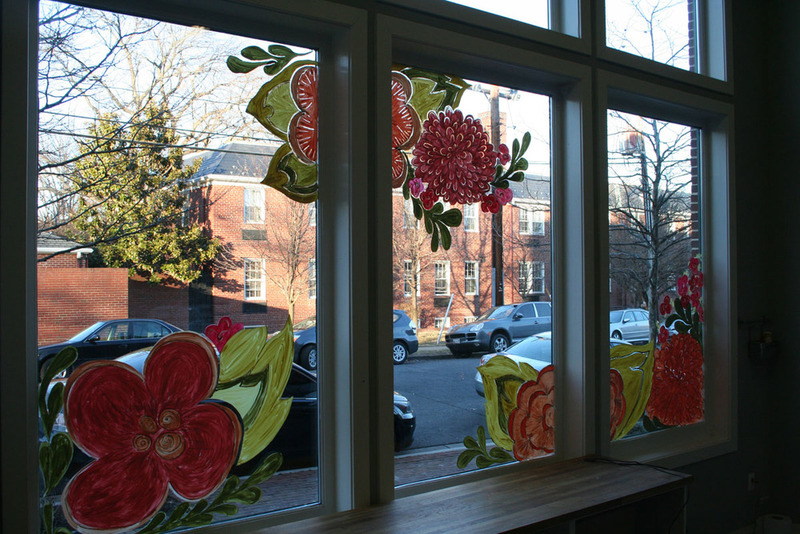 To convey what we’re feeling on the inside even though it might be a month too early for it on the outside, we handpainted big colorful blooms on the Fleurir Old town Alexandria window. We went with less realistic, almost cartoonish flowers that felt a little more playful than your typical spring prints. 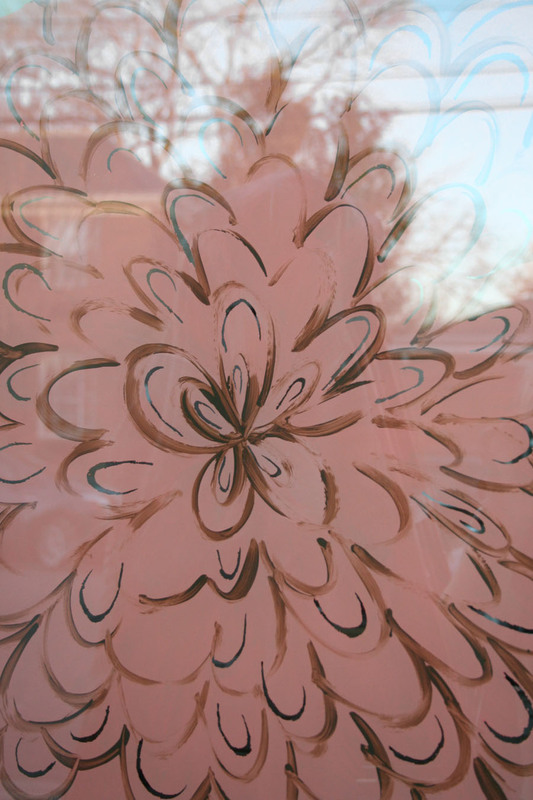 This is our third handpainted window and every time we learn new tricks that make it easier and more dynamic. To get the flowers just right we took a sketch of Emily’s and enlarged it using a projector. Our projector is the Tracer Jr. from Michaels, they aren’t cheap so make sure to use a 40% coupon that is almost always available on their app or in their weekly mailer. 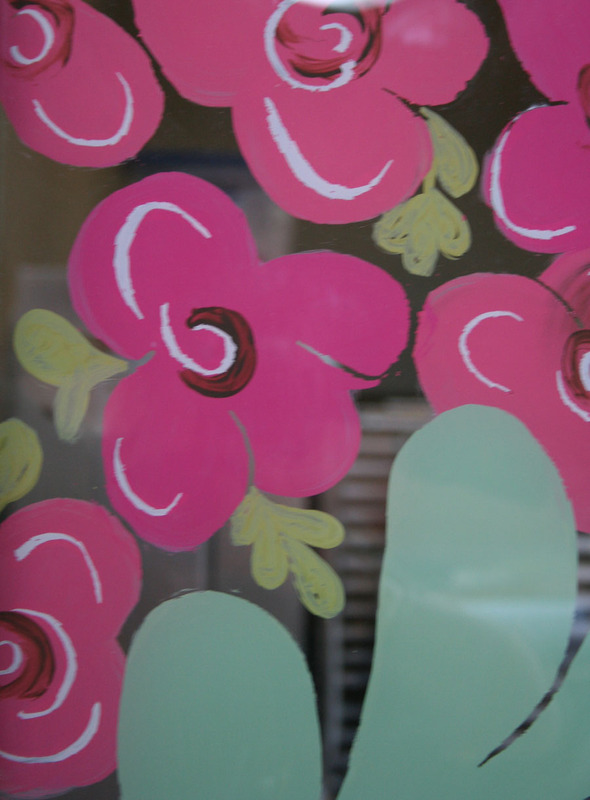 We drew the flowers on brown butcher paper and taped them up on the outside of the windows, painted the outline in a dark brown, and filled in with our bright pinks and corals for the flowers, then sage and citron greens for the leaves. This time we experimented more by coming back in with a blade and scraping away portions to exaggerate the curved edges of the leaves. We also used a wooden sculpting tool (softwood won’t scratch a window) to add in swirls and details in the flowers. For some of the flowers we painted in the negative part to add a pop color, but others we left translucent to help define the flowers more. The end result is a fresh floral window we’re hoping pushes that dumb ground hog back into his hole and lures an early spring out from behind this rather harsh winter! Today we made our way to Fleurir’s Chocolates in Old town, Alexandria. This space doubles as both another retail store and their kitchen where they make all of the amazing sweets. We love working in this space so we can see behind the scenes and taste test everything! While we were there yesterday, they worked on their special Valentine’s Day Box which will all draw flavors from flowers. We can vouch for those floral favors, they are delicious. The windows for this kitchen/shop are huge and there are three of them! We knew we were going to be using latex house paint again and wanted to go with a bold graphic. Using hearts is an obvious for Valentine’s Day, but nothing nails down that message better so used them to create a pattern leaving a negative space heart at the bottom to feature Fleurir’s chocolate boxes. This window was a great example of how paint can very easily and inexpensively transform a window into a display element. We made stencils by cutting hearts into a stiff paper, like card stock, instead of spending extra money we just used the cardboard leftover from a 12-pack of cost cutting ice cold Diet Coca-Cola. You could use any shape or design you want and then just use a paint brush to fill in the negative space. We “made” a modern pedestal for the boxes by making a quick trip to the Crate and Barrel outlet down the street and stacking a white ceramic plate and vase! 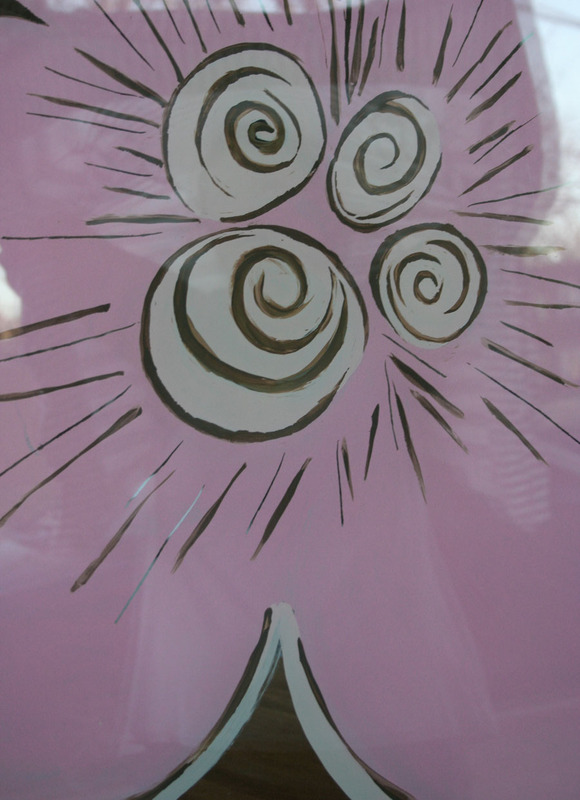 We’ve gotta say, painting all of the hearts on these windows made us feel a little nutty, like in the Kay Jewelers commercial with Jane Seymore in her studio painting “open heart” after “open heart” with her crazy eyes…but it was worth it! Enjoy the pictures and stop by Fleurir for some amazing local chocolates! This post is coming a bit late and on the coat tails of us being able to photograph it right before we took it down for Fleurir's Valentines Day window. We loved the idea of a snow owl family, one for each member of the owners family for their Georgetown Christmas window. One of the best things about using animals for display is their ability to create whimsical narratives in small spaces. We had way too much fun making this feathery flock! We started by loosely balling up paper and taping it together to create the owl's main structure, then used masking tape to help define the owl form. For the plumage we used white watercolor paper that we tore by hand to get a rough feathery edge and a mix of inexpensive feathers purchased at our local craft store. To add some detail to some of the top coat of torn watercolor feathers we used a wood burner especially.